Regression testing usually does not get the necessary attention from top-level management. In fact, regression testing might even come across as an expensive tantrum of testers – and when the budgets are tight, it faces the maximum possibility of a blow. This is where enterprises need to tread carefully. Re-performing tests on already tested features is often viewed as paranoia by the management. But, this is what will ensure delivery of valuable software to the users. Think of it as a double check before the final release. Regression testing prevents the application from blowing up on your face. The complexities and sheer size of the codes written for an application make it practically impossible to determine the impact of even a minor update or bug-fix. This is where regression testing comes into play. By analyzing core functionality and performance, it makes sure that any updates do not throw the application off the edge. It also makes sure that all the interdependencies in the code work seamlessly. 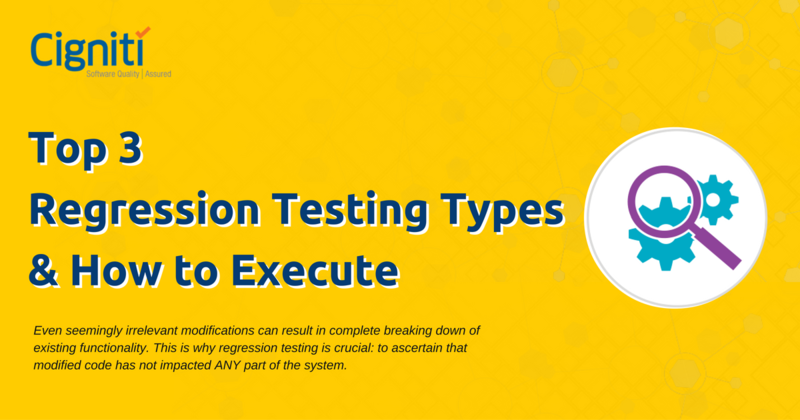 When to perform Regression Testing? Knowledge of the existing application: Despite the popularity and wide-acceptance of Agile and DevOps methodologies, there are still many enterprises that follow Waterfall structure. The siloed structure of Waterfall makes it impossible for testers to be aware of the changes made by the developers. Due to this, they are obliged to run complete regression test suites, which can be back-breaking and time-consuming. In Agile and DevOps, testing is the responsibility of the entire team. As the barrier between developers and testers is lifted, everyone is informed of even the slightest of changes. This eliminates the need to run the full test suite. Instead, regression testing can be done only on the areas where the changes have been done. Expensive: Due to the need for faster deployments, regression testing is seen as a burdensome, redundant step that delivers little value. Delegating resources and allocating budget for such process can be difficult to justify. Test Case Selection: For regression testing, time is an unaffordable luxury. Due to this, there is no window to run large test suites. To make the most efficient use of the time in hand, testers need to carefully select and decide which test cases to run and especially, which test cases not to run. Highly complex products: As new updates keep adding to an application code, test cases have to be maintained accordingly. With the expansion of features and functionalities, the complexities of both code and test cases increase. In such a scenario, it is very easy to lose the track. Small and frequent releases: It is easy to perform regression testing on smaller codes as compared to full releases. Developers should be encouraged to keep deploying sections of an upcoming release to the test environment, so that it becomes possible to test and provide feedback simultaneously. Automate: Regression testing requires cognitive intelligence to identify which test cases to perform, and which areas to analyze after an update. Automation can be employed to obliterate the redundant part of the process. This means that regression testing should be automated for those components which remain unaffected by the update. By doing so, a significant chunk of time can be saved, and testers can better focus on the areas that need their undivided attention. However, relying completely on automation can have a negative impact on the quality of final product, defying the whole purpose of regression testing. Review meetings: Testers should actively participate in the code review meetings. It does not matter if they have any knowledge of coding. Being involved in code reviews will keep them updated on the changes made to the code. This further enables them to center their attention to those changes at the time of regression testing. Scrutinize the changes and analyze their impact on different components. Create new test cases or modify the existing test cases accordingly. Perform random testing under different user scenarios. Deliberate consideration should be given on which automation tools to use. Test environment should be designed carefully so that it can mimic the actual scenarios in the best way possible, thus, providing excellent test results. An application should deliver value to the customer. The value can be in terms of speed, efficiency, accuracy or performance. 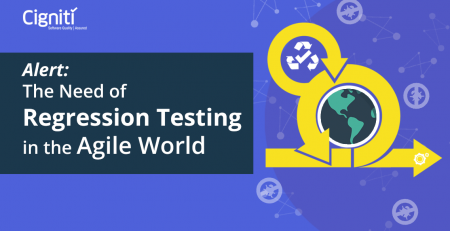 With regression testing, enterprises can make sure that their application delivers on all these parameters, generating the utmost level of satisfaction among the end users. Instead of a second step or after-thought, regression testing should be initiated right at the beginning. Cigniti’s systematic approach to Regression Testing ensures minimum disruption while keeping costs under control. Our Regression Testing suite guarantees that the new features or enhancements to the application do not cause any unintended impact to the existing quality of the applications. Our test teams thoroughly understand and perform impact analysis of the changes that are made to the test environment and the application(s). Changes to the test environment can happen in the form of alterations in the deployment configurations, database updates and operating system updates to name a few. Changes to the application can happen in the form of bug fixes, new functionality, functionality enhancements, integrations, patches, interfaces etc. 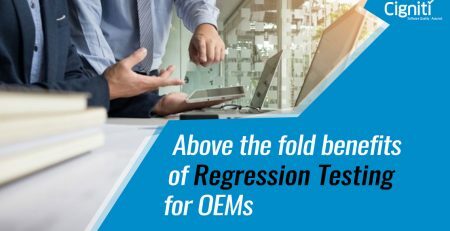 Connect with us to leverage our regression testing solutions that can ensure outcomes of these enhancements play out only as originally planned.